As regional growing operations open their greenhouse doors, many growers are looking for reliable information they can use to produce higher quality crops more economically and sustainably. This article represents an example of the useful content Paulsen could provide to help establish your business as a leading authority on grower-related topics. When it comes to growing perennials, cool and slow is the name of the game. And in climates that support it, that is best accomplished by growing outdoors. If you’re looking to save money and produce excellent crops of finished perennials from spring through fall, an outdoor growing operation may be your best solution. Why does quality go up on some crops when grown outdoors? Cool nighttime temperatures keep rapid elongation in check and lead to stronger stems. High light levels result in more compact plants with higher bud counts. And good airflow through the crops keeps diseases from forming and plants from sitting too wet for prolonged periods. Perennials grown outdoors often are fuller, more compact and better branched, with richer-colored foliage, and more flowers with deeper pigments. The same plants grown in heated greenhouses often have a lower perceived value, weaker stems and paler coloration. If your climate or location allows, consider installing outdoor production beds for specific crops. They are much more economical to install and maintain compared to greenhouses and often yield better results. You truly do get more for less! Three top recommended perennials for outdoor growing operations include Hibiscus, Salvia and Lavandula. Quick reference tips for each of these crops are detailed below, as well as a list of additional perennials to consider growing outdoors. You may wish to experiment with others in your inventory to see if better crops can be yielded by moving them outdoors. 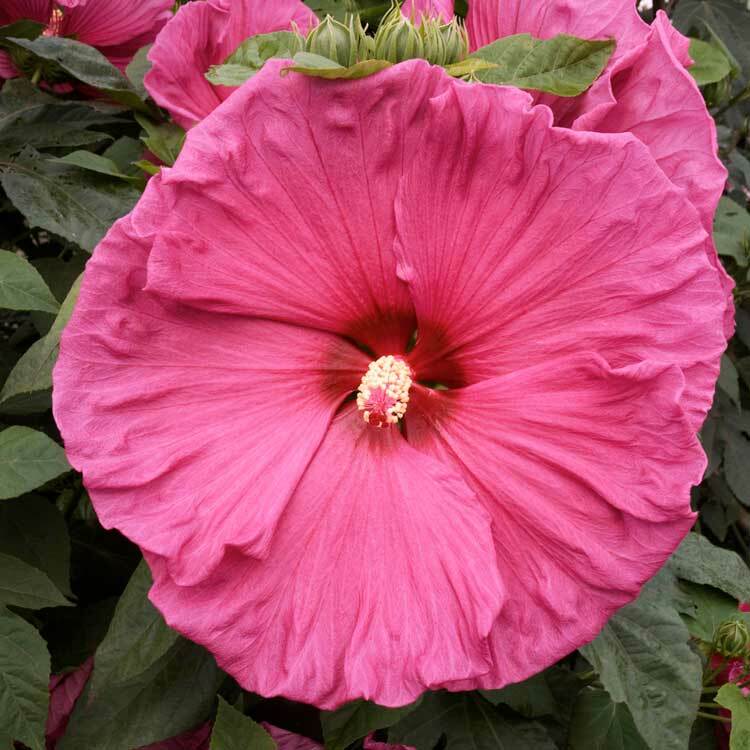 For a spectacular crop to extend your sales season, grow hardy hibiscus. Bare root plants grown in 3-gallon containers outdoors are superb from summer through fall. Plant one bare root plant per 3-gallon container in a peat/bark soil mix with a pH of 6.0-6.5. Place dormant plants directly outdoors after threat of frost has passed, spacing pots a minimum of 18” apart (wider is better). Hook pots up to drip irrigation if possible. Never let Hibiscus dry out as it will result in wilted, yellowing leaves and bud drop. Once plants begin to grow, pinch back the top growth once to 3-5 nodes to achieve well-branched finished plants. Hibiscus are heavy feeders. Use 150-200 ppm N constant liquid feed at every irrigation. An EC rate of 2.5-3.5 using the pour-through method is best. Scout regularly and treat for pests including Japanese beetles, sawflies, spider mites and whiteflies. Full sun is necessary for foliage and flowers to color up properly. Allow 12-14 weeks for plants to finish before first sale. 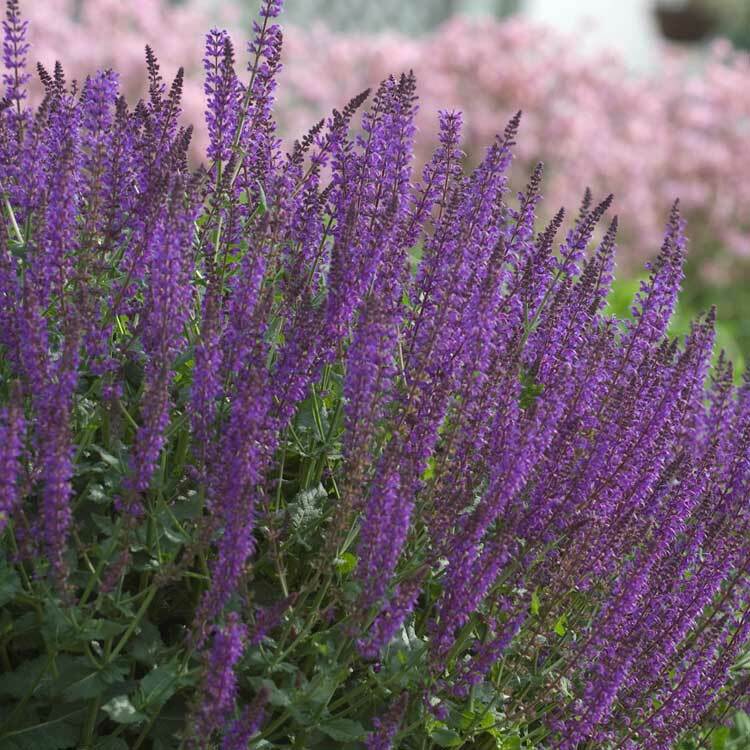 Salvia is a quick turn, cool season crop that is prime for growing outdoors for spring sales. Plants grown outdoors are significantly fuller with no need for PGRs and have a very high bud count. Plant one bare root plant per 1-gallon container in a well-drained, peat/bark soil mix with a pH of 5.8-6.2. Cooler springtime temperatures act as a natural growth regulator on Salvias. There should be no need to pinch plants before sale. Higher light levels naturally result in a higher bud count on plants grown outdoors. Water plants thoroughly in the morning, allowing the foliage to dry by nightfall. Allow the soil to dry slightly between waterings. Do not allow plants to sit wet for prolonged periods or the foliage will turn yellow. Salvias are low to moderate feeders. Use 50-75 ppm N constant liquid feed at every irrigation. An EC rate of 1.5-2.0 using the pour-through method is best. Just 6-8 weeks are needed for plants to come into flower from bare root. 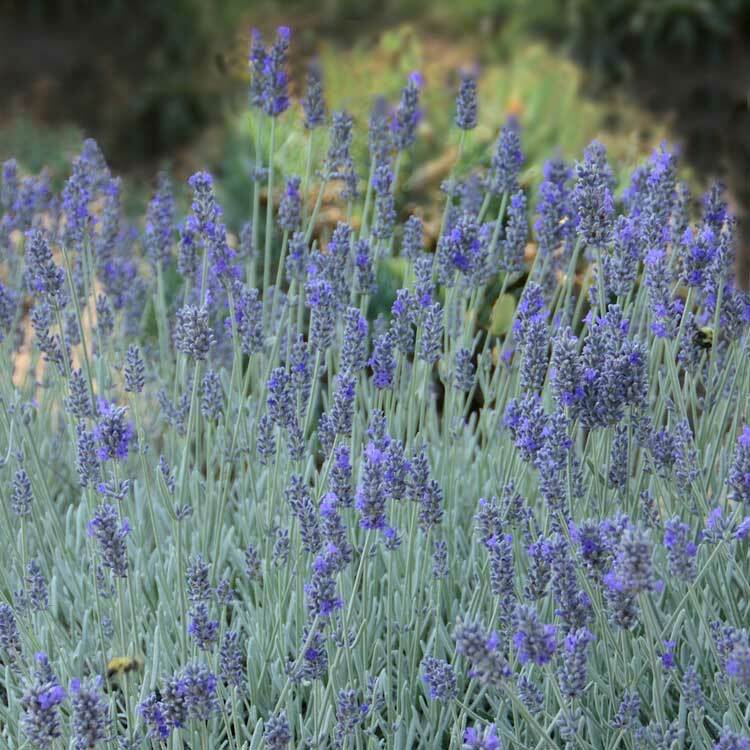 Lavender is easy to grow in the garden, but takes a little expertise to grow in production. Outdoor growing is highly recommended in zones 6 and warmer. It takes a little longer than growing plants indoors, but the finished product is far superior in habit, flowering performance and flower color. Far fewer losses will be had by starting bare root lavender in spring rather than in fall. Take advantage of longer days, higher light levels and warmer spring temperatures. Pot plants up immediately upon receipt to prevent their evergreen foliage from drying out. Plant one bare root plant per 1-gallon container in a well-drained soil mix of peat, perlite and bark with a pH of 5.8-6.2. Set the crown just at the soil surface taking care not to bury any branches. Move bare root plants outdoors in full sun once temperatures are consistently above freezing. Cover plants with a heavy 3 ounce frost blanket in the evenings and pull it back when daytime temperatures are above 40°F. Hook pots up to drip irrigation if possible to avoid wetting the foliage and help prevent disease. Allow the soil to dry slightly between waterings. Do not allow plants to sit wet for prolonged periods. Lavandula is a low to moderate feeder. Use 50-75 ppm N constant liquid feed at every irrigation. An EC rate of 1.25-1.75 using the pour-through method is best. Allow 8-10 weeks for plants to finish before first sale. Bulks up well, stronger stems, more compact, notably higher quality finished product. More compact, fuller appearance, higher bud count, crop flowers more uniformly. Cooler temps keep plants more compact. Higher light levels reduce stretching, increase bud count and intensify the flower color. Fuller, thicker plants with less stretch and stronger stems. Proper coloration developed outdoors. Longer sales window and season of bloom when grown outdoors. Can be scheduled for multiple sales windows. Plugs started season prior can be grown outdoors under 50 percent shade and overwintered in hoop houses. Resulting plants are fuller and stronger. Longer sales window as cool temps hold the flowers longer. Not recommended for areas with heavy rainfall. Cool temps and wider spacing keeps plants naturally compact without pinching or PGRs. Plants are more compact and with higher bud counts due to cool temps and high light levels. Disease less prevalent due to good airflow. Far fewer losses when grown outdoors. Benefits from high light levels, good airflow and cool temps. Better bulking outdoors, very quick turn for early spring sales. Very easy outdoors. Plant it and forget it. Much higher quality finished plants when grown outdoors. Small plugs best started outdoors the spring prior to sales. Increased stem count, plants bulk up well, higher bud count. Photos courtesy of Walters Gardens.